Frank Clark’s playing career could not have ended any better. In his final competitive game, he and his Nottingham Forest teammates beat Malmö 1-0 to win the 1979 European Cup final. It was the kind of fairy-tale ending that a certain Gianluigi Buffon is currently dreaming of. However, his managerial career ended in far more disappointing circumstances. 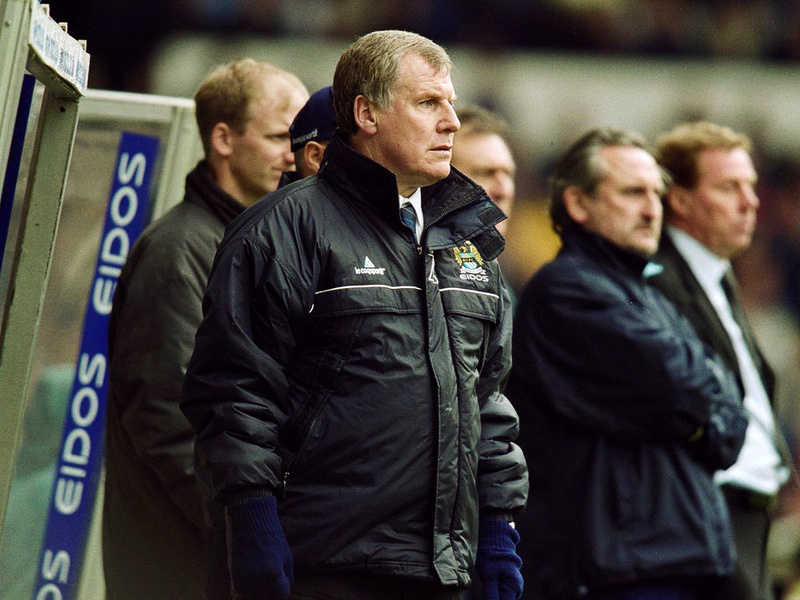 In February 1998, he was sacked as Manchester City manager with the team failing to cope with the demands of the First Division. In his place stepped Joe Royle, a man who many pundits thought was far too qualified to be taking over a relegation-threatened club. During his 12 years at Oldham Athletic, he took the provincial club to the top flight and the League Cup final. When Royle then took over as Everton manager in November 1994, he guided them to victory in the FA Cup final and the Charity Shield. Yet despite all his previous managerial achievements, he failed to keep City up. Finding themselves two divisions below arch-rivals Manchester United heading into the 1998/99 season, City were in despair. If you are not sure what those City fans who always say ‘I was there in the dark times’ are on about, this is the period they are on about. However, the reality was not as depressing as those Mancunians like to make out. This was because they had a quite brilliant manager. While he may not have been as glamorous as Roberto Mancini or as suave as Pep Guardiola, Royle knew how to get a team promoted, though in spite of his CV, his first full season at Maine Road started gravely. By mid-December, City were flagging in 12th place after losing 2-1 to York City. It was a moment that the Manchester Evening News described as ‘the blackest day in City’s history.’ Perhaps if it wasn’t for the Christmas cheer, Royle may have even been sacked. But he wasn’t and City rallied. They became a force to be reckoned with as they made it all the way to the Second Division playoff final. That day they came up against Tony Pulis’ Gillingham, which, as you can imagine, was no easy prospect. While his maiden job may have been at Bournemouth, Pulis’ time in Kent was the first big success of his long and accomplished managerial career. When he took over from caretaker manager Neil Smillie in 1995, the Gills were languishing in the Football League’s bottom tier. But through his successful and highly contested coaching style, Pulis managed to drag Gillingham to within 90 minutes of the First Division. His team that day included ex-Tottenham Hotspur defender Guy Butters, the evergreen captain Andy Hessenthaler, and star-striker Carl Asaba. They were a well-organised unit, playing in a modern 3-5-2 formation that allowed Pulis to pack the midfield and play with two centre-forwards. It’s the kind of system that Max Allegri often employs at Juventus, just with far, far less quality. Royle appreciated tradition and deployed a solid 4-4-2 to deal with their strong opposition. Led by the experienced Andy Morrison, City’s team included the tough-tackling midfielder Michael Brown, Dutch defender Gerard Wiekens, and the one and only Shaun Goater. A striker born with a desire to smash the ball into the back on the net, Shaun ‘the goat’ Goater came to Maine Road in March 1998. After scoring 40 league goals in two years for Bristol City, Royle persuaded chairman David Bernstein to pay £400,000 for his services. 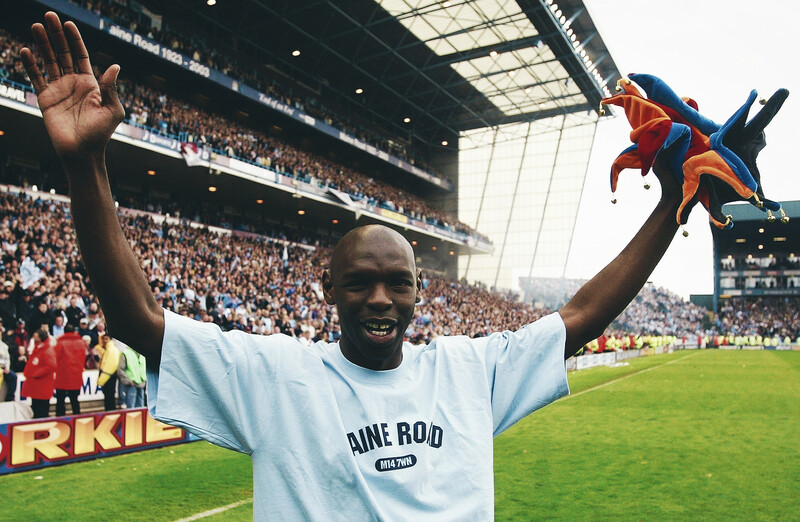 While he may not have been able to keep City up that season, Goater became a phenomenon over the next three years. Royle’s talismanic striker scored 60 goals in all competitions to go down in history as City’s ultimate cult hero. 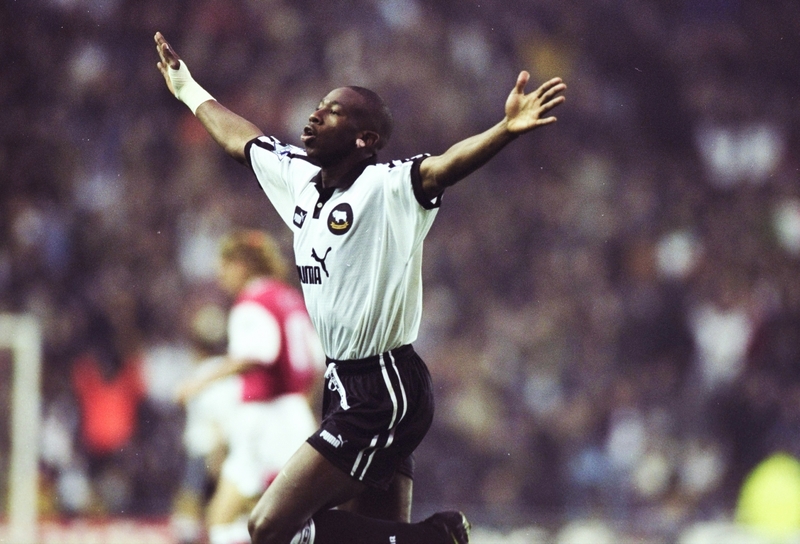 Yet in the biggest game of the 1998/99 season, Goater struggled. Like many playoff finals, the game was a tight affair with few and far chances between. After 80 minutes without a goal, the match looked like it was going to dwindle into extra time. But all of a sudden, the game sparked into life when Asaba found himself clean through on goal. A striker of his quality was not going to waste this chance, and he duly hammered the ball into the onion bag to send the famous cap wearing manager into dreamland. Just five minutes later, Rob Taylor doubled Gillingham’s lead to all but secure promotion. But as we all know, when City need two goals in the last minute of the final game of the season, they know how to get them. Late strikes from Kevin Horlock and Paul Dickov took the match into extra-time and subsequently to penalties. Penalty shoot-outs are always tense, and this occasion was no exception. With City leading 3-1, Butters needed to score to keep Gillingham in the game. Standing in his way was Nicky Weaver, a 20-year-old who was playing in his first full season as a number one goalkeeper. As Butters nervously struck the ball towards him, Weaver dived to his left and palmed it straight back to Gillingham’s number five. In an instant, City fans all over the old Wembley exploded with joy. Seeing the heap of joyous players heading towards him and knowing an almighty pile-on was coming, Weaver hastily evaded. “I just ran and ran and ran,” explained Weaver to the Manchester Evening News in 2011. “The lads [eventually] piled on and I just couldn’t breathe.” After the game, the celebrations continued as the blue side of Manchester partied for hours and hours. But a run of seven games without a win changed all of that as they fell out of the top two. However, just as they showed in the playoff final, Royle’s City were a team that did not give in. After their disappointing 2-2 draw with Stockport County, they won six out of their next eight games; remaining unbeaten in the process. Despite their incredible run, automatic promotion remained in the balance heading into the final game of the season. Considering the notable support City received under Royle, it was unsurprising just how many fans celebrated their promotion to the big time. The Citizens average home attendance during their time in the third tier was a remarkable 28,261; the following year, that figure never dropped below 30,000. “The City fans are up there with the best in the business,” said Royle in 2011. “Their support for the club through thin and thin has been outstanding.” With promotion in the bag and his sky-blue army behind him, Royle could start planning for Manchester United away. To deal with the challenging Premier League opposition, in came Alf-Inge Håland, Paulo Wanchope, Steve Howey, Andrei Kanchelskis, Richard Dunne, Laurent Charvet and Darren Huckerby. Royle also managed to sign the 1995 Ballon d’Or winner George Weah. Not even anyone in the current crop of City players, with all their titles and cups, can claim to have a Ballon d’Or trophy sitting above their mantlepiece. However, Weah proved to be a spectacularly unsuccessful signing. Frustrated with his lack of game time under Royle, he demanded to leave and City were forced to terminate his contract for the hefty fee of £500,000. This, added to the £250,000 in wages he picked up during his 10-week stay in Manchester, meant that his only goal for City cost them £750,000. While this may seem like a drop in the ocean in modern football, back then it was a stupendous amount for a solitary strike. With flops like Weah in his squad, it may come as no surprise that City were relegated that year. They picked up just eight wins all season, finished eight points below 17th-place Derby County, and 46 points behind champions United. Perhaps most disappointingly for Royle, though, the relegation signalled the end for him at City. It had been a remarkable three years for the former Evertonian who, through the likes of Goater, Weaver and Dickov, created an exciting football team that had a cult following. Thankfully for Citizens everywhere, Royle’s successor, Kevin Keegan, managed to keep the core of that team together and won the First Division with 99 points. Since then, Goater and co have stepped aside for the likes of Sergio Agüero and Vincent Kompany. City fans also remember Royle favourably. In 2015, leading City fan-run YouTube channel BlueMoonRising ranked the coach number five in the club’s all-time top managers. While Royle may soon be squeezed out of the top five by Guardiola, the job he did will always be recognised by the blue half of Manchester. When historians try to pinpoint the start date of City’s revolution, it is unlikely that there will be a consensus. Many will contest that it all started in September 2008 when Sheikh Mansour bought the club, while others will point towards Keegan and his successor Stuart Pearce for stabilising them in the Premier League between 2001 and 2007. However, I contest that City’s revolution began in February 1998 when Royle was appointed as manager. Within three years, he transformed them from a third-tier side into a Premiership outfit. He laid the foundations for a team that would eventually be converted into one of Europe’s best, and, without his work, it is questionable whether City would have been able to recover from their relegation to the third tier. While many pundits and sport writers may often overlook the job he did, no true City fan in their 30s or 40e will ever forget the days when they pleaded with Royle’s side to “feed the goat”.